As I've been spending more late nights at my desk, if front of my computer, I've been getting lonely. Fortunately, I have this guy to keep me company. Gus, an Asian lady beetle, like the one to above, has been hanging around my work space lately. He has been recently obsessed with my desk lamp. I think this guy's been in my room since the beginning of winter--how he's managed to survive is beyond me--so I've actually had a third roommate this whole time. Curious as to the origns of my Far Eastern friend, I googled him. Turns out the Asian lady beetle was brought to the States to control the aphid populations. Aphids eat trees and such, and our own capitalist ladybugs got lazy and stopped doing their jobs. So the hardworking Asians were sent in. I guess it'd be considered outsourcing [or would that be insourcing]. Either way, the lady bugs' Oriental cousin did a much better job, as expected, and their populations thrived. 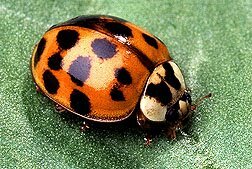 In late autumn, the Asian lady beetles are known to swarm around buildings in preparation for hibernation [overwintering] and have become kind of a nuisance. Yet, this guy doesn't bother me too much. He keeps me entertained as I meddle away at my laptop. I can't help but feel a bit silly [sad, even] making an entry about my lady beetle friend, but such is my life right now. FUN FACT: As a defense mechanism, the Asian lady beetle secretes a yellowish liquid from its leg joints. This happens when it is about to be squashed [i.e. if a bird were to eat it]. This would explain why the walls behind my picture frames have stains running down. And all this time I thought my walls were bleeding. you are so diverse. maybe gus can teach you how to make asian fusion cuisine. Asian fusion? Like what, Ramen Noodle Pizza? In terms of cuisine I'm not that diverse. . .